I was so excited when Sina asked me to join in her virtual Shabbos table on her blog. First of all, I love Sina! Besides the fact that her photography is amahhhhzing and her recipes are innovative and exciting without being too complex, she is such a nice person! I had the opportunity to meet with her when we took our trip to Israel in December. Guys, she’s so nice, and pretty and normal!! Second of all, a blogger round up is like a thing of my dreams ever since I saw the virtual baby shower for @howsweeteats like 4 years ago. So, thanks for making this happen and thank you for choosing the most perfect apropos topic! Shabbos for me and my family is especially special. As a full time working parent, my day consists of the morning rush, work from 9-6 and then a very short window of time where I can spend about an hour with my kids before they get shipped off to bed. BH I have help in the house to watch them, bathe them and feed them dinner before I get home so that time with them is as stress free as possible, but still, even with each kid’s “five minutes of cuddles,” it’s never enough. And Sunday, forget about Sunday. It’s a day spend shopping, prepping and getting in all the recipes I might need for the week. I almost never sit down on Sunday, let alone give my kids the attention they should be getting. Shabbos is the time to unplug, to rest my brain and actually spend time with my children. For a while, Shabbos in our home was focused more on the rest part. We would show up to the Shabbos meal in glorified pajamas, eat a quick meal and sleep for hours. The term “a bagel” became synonymous with Shabbos. But then, as the kids got older and they began coming home with stories about the parsha and Shabbos and their weekly projects we realized a change needed to be made. We made an effort to establish new habits that enhance the mood of Shabbos, increase the spiritual aspect of the day and give the kids something to look forward to. The struggle is real guys. The competition against the constant drone of technology is really really hard. Seriously, I’m terrified of my kids growing up in a world where Shabbos is just not appealing to them because they don’t have meaningful relationships with their friends off Snapchat and Instagram and where they don’t know how to entertain themselves without TV or Netflix. It’s why Shabbos is so important to me, to my family, to let them know how important it is to spend time together, to talk to laugh, to analyze and sing, to eat good food and talk about ideas and aspirations. To be heard, to be loved, to be at peace. It’s why we started coming up with routines that set Shabbos apart, we make challah together, we prep for Shabbos meals together, we light the candles together, we talk about projects and parsha and go to shul. We play with friends we read books together. Shabbos becomes a time of together, so that later, on Shabbos, my kids will not feel alone. 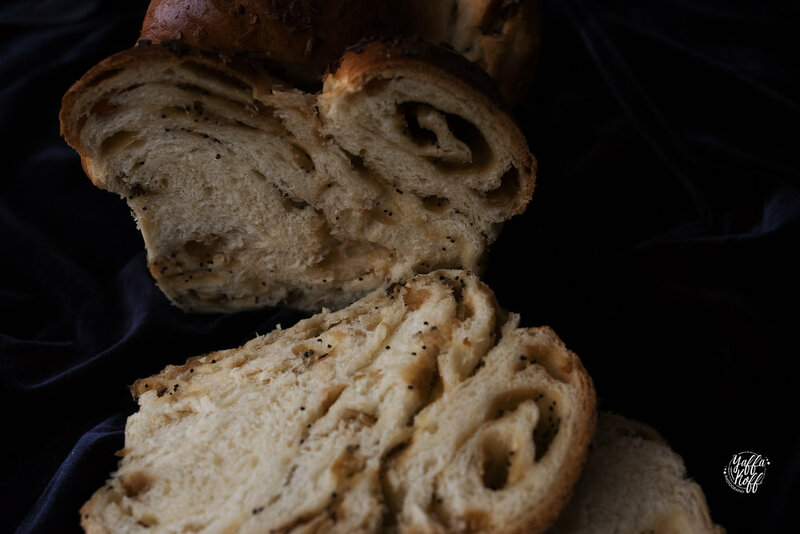 So of course, this challah makes wonderful loaves, the dough is easy to work with, the taste is a little sweet, soft with a good chew and not too pillowey or bland. 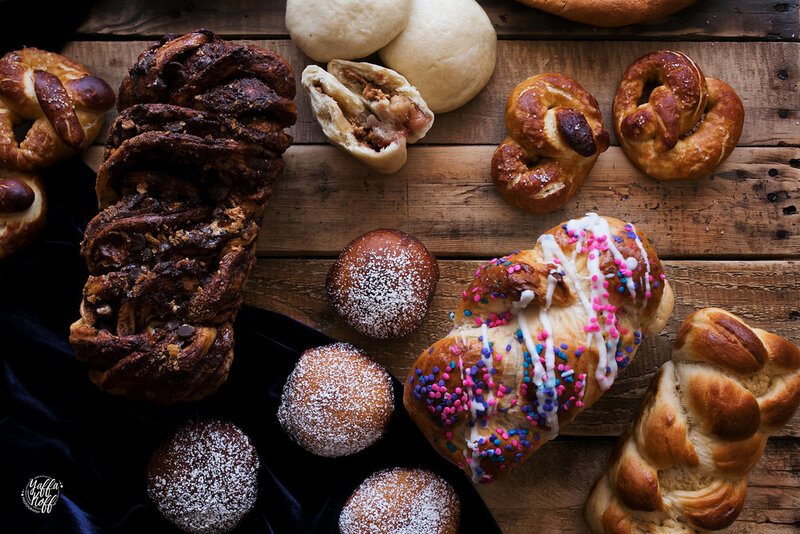 It goes great with a million toppings for example: everything bagel spice, zaatar, garlic and onion, or sweet options like sprinkles and streusel. And then I stuff it like every challah should rightfully be stuffed with pesto, beets and goat cheese, fig jam orange and cardamom, caramelized onions, mounds of cheese and jalapenos, apples and cinnamon, peanut butter and jelly, and of course classic deli roll challah. I probably extend the use of challah well beyond any normal person’s use of challah dough but the truth is, why shouldn’t it? It’s got a nice sweet flavor that isn’t too sweet for savory and isn’t too savory for sweet, you know what I mean? Note: All photos for this post were done by the incredible @yaffakoffphotography! Check her out because she also takes pictures of babies and who doesn't like looking at babies? · Then, add the eggs, oil and salt and whisk until combined. · Add the flour about a cup at a time until the dough is no longer sticky but is not tough and hard to work with. It should be smooth and bounce back when pressed. · Coat the dough and bowl in oil. You don’t have to drown it, just enough so that it wont stick to the sides of the bowl when rising. · Cover the dough with a towel and allow it to rise for about 2 hours. Punch it down about 3-4 times in middle of the rise. · Divide the dough into chunks and roll them out on a smooth surface. You may use flour here to prevent sticking but I usually find it unnecessary and it makes the challah tough. 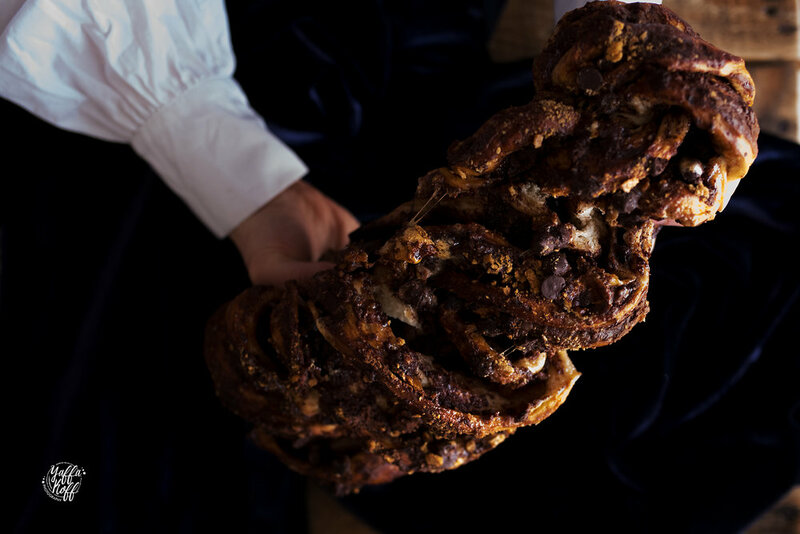 · Braid your challah and allow it to rise, covered, for another 45 minutes. · You may brush your challah with egg wash but I do not do this. 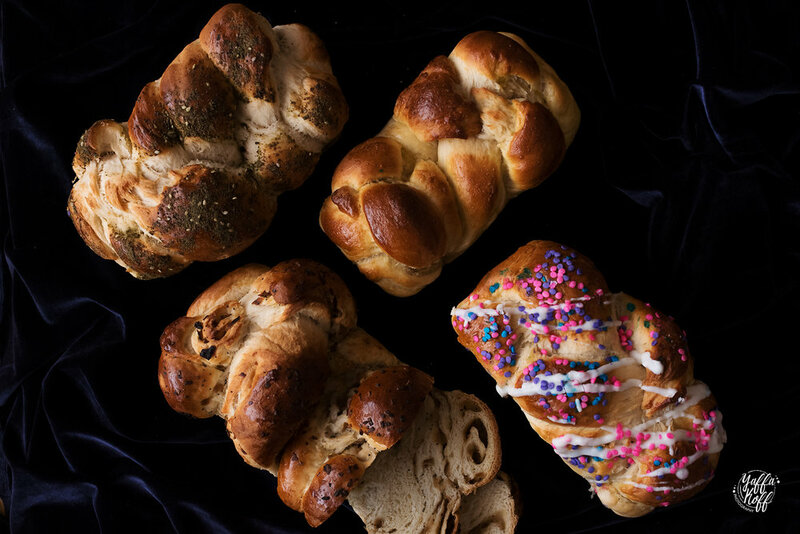 · Bake your challah for 30-45 minutes depending on the size. The crust should be a deep brown, and the challah should feel light and sound hollow when tapped. · Allow it to cool and enjoy! Note: This recipe can be made in a 6 qt. mixer. You may need more flour as the mixer incorporates the flour better into the dough. Braid challah as desired, allow to rise for 45 minutes. Brush with egg wash and sprinkle topping of choice. Bake as directed. Before braiding challah roll each dough portion into a thin rectangle. Slather or layer filling as desired leaving about ½ inch of blank dough at the end of the long side of the rectangle. Roll into a long rope and repeat with remaining dough. Braid and bake as directed. Mix 3 tablespoons spicy brown mustard with ¼ cup duck sauce and tablespoons of mayonnaise. Brush challah with the mixture and top with slices of turkey breast, pastrami and corned beef. You may need to cut them to fit them properly. Sauté two large diced onions in 3 tablespoons of oil over a medium-low flame. Stir every so often to be sure that the onions do not burn. Allow the onions to turn a dark brown. This should take about 20 minutes. Remove from the flame and mix with 1 tablespoon of poppy seeds. Add a pinch of salt. Use the mixture to fill the strands as instructed above. Divide challah into small fist size rolls. Roll the dough into circles where the middle is thicker than the sides to make for a center that can stretch to hold filling and ends that will come together easily to pinch closed. Fill the circles in the center with about a tablespoon and a half of desired filling and pinch or twist the ends together. Place on a small square of parchment paper with the dough’s seam side down. Place a steamer basket over a pot of water. The water should not touch the basket. Bring the water to a boil. Place the parchment paper with the buns on top in the steamer. Be careful not to overcrowd the buns. Steam for 10-15 minutes or until the dough is light and fluffy. remove from steamer to cool and serve immediately. 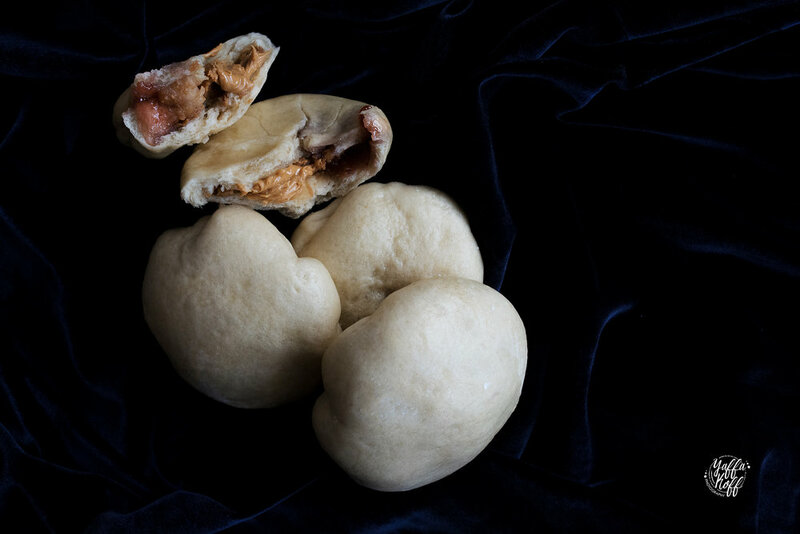 To make challah boa buns check out this post. 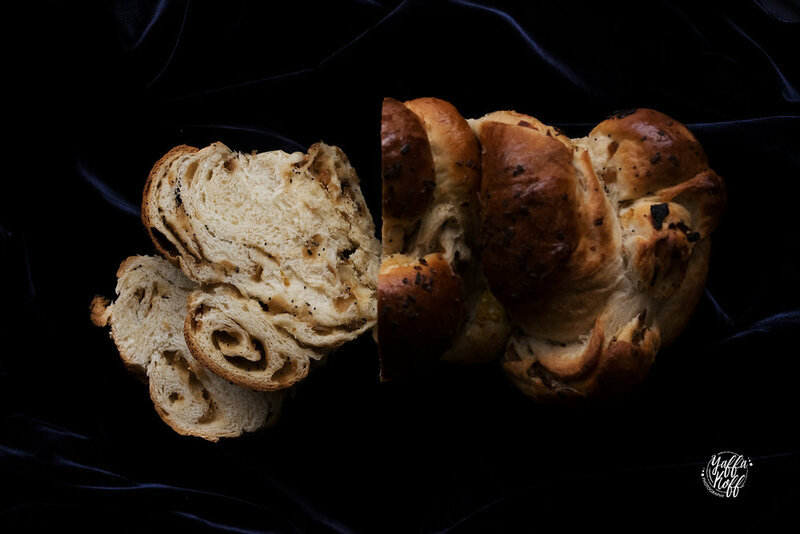 Using a larger portion of dough than a normal challah strand, fill and roll the challah dough with desired filling the same way as the stuffed challah above. Before braiding the strands, slice the rolled strand in half and twist the strands together so that the filled side is facing upward. Place in a loaf pan and allow the dough to rise for 20 minutes covered. Brush with egg wash and then, bake as directed or until golden brown. As the babka is baking heat 1 cup of water and 1 cup of sugar in a pot until the sugar is dissolved. When the babka comes out of the oven brush immediately with sugar syrup and allow the babka to cool. Spread the dough with Nutella, sprinkle with chocolate chips and 2-3 tablespoons of light brown sugar, roll and bake according to directions above. Mix one 15 oz. can pumpkin (not pumpkin pie filling) with ½ cup of brown sugar, 1 tablespoon pumpkin pie spice and 1 teaspoon of salt. Slather on in a thin layer and roll carefully. This one is very slippery so be careful when rolling. Spread the dough with marshmallow fluff and chocolate spread. Top with marshmallows, chocolate chips and graham cracker crumbs before rolling and twisting. After brushing the babka with egg wash, top with more graham cracker crumbs and chocolate chips. Divide the challah into fist size rolls. Place on a cookie sheet lined with parchment paper and covered in saran wrap. Allow to rise in a warm place for 30 minutes or until soft and fluffy. In a large wide pot, fill with oil about halfway and heat the oil to 350 F. Fry about 30 second to a minute on each side or until golden brown. Fill as desired or dip in glaze and top with sprinkles or powdered sugar. Divide the dough into fist size portions and roll each into a single long thin strand. Twist the two ends together away from you leaving about ½ inch of loose end. Then bring the twist down toward you so that a pretzel shape forms. In a large wide pot, boil about 9 cups of water along with ½ cup of baking soda. Boil each pretzel for 30 seconds and then remove with a slotted spoon on to a baking sheet lined with parchment paper. Sprinkle with coarse salt and then bake for 15- 18 minutes at 400 F or until golden brown. Divide the dough into fist size portions and roll each into a single thick strand. Bring the two ends together and push your hand through the hold in the middle to firmly roll the two ends together so that a ring shape forms. Allow to rest for about 15-20 minutes or until the dough loosens. In a large wide pot, sill halfway with water and bring it to a boil. Add 1 tbsp. of barley malt or dark honey. Boil each bagel for about 1 minute per side or until the bagels float to the top of the water. Remove with a slotted spoon on to a baking sheet lined with parchment paper. 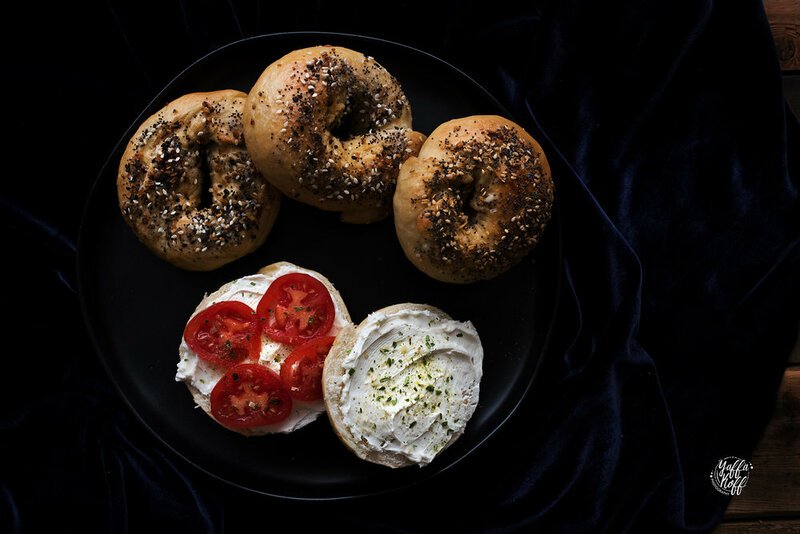 Dip the bagels into toppings as desired and bake at 475 for 15-20 minutes or until golden. Preheat the oven to 450 F. Place a pizza stone or upside-down metal pan into the oven to heat as well for about 20 minutes before you bake your pizza. Divide the dough into large softball size portions. Allow the dough to rest for 15 minutes. Until floured hands/ rolling pin, roll or gently pull the dough into a large thin circular shape. Place on a large sheet of parchment paper and brush the outer crust with olive oil. Carefully place the parchment paper holding the dough into the oven on the stone or pan using a pizza peel. Bake the dough for 15 minutes or until it is a light golden color. Spread the blank crust with sauce and cheese as desired. 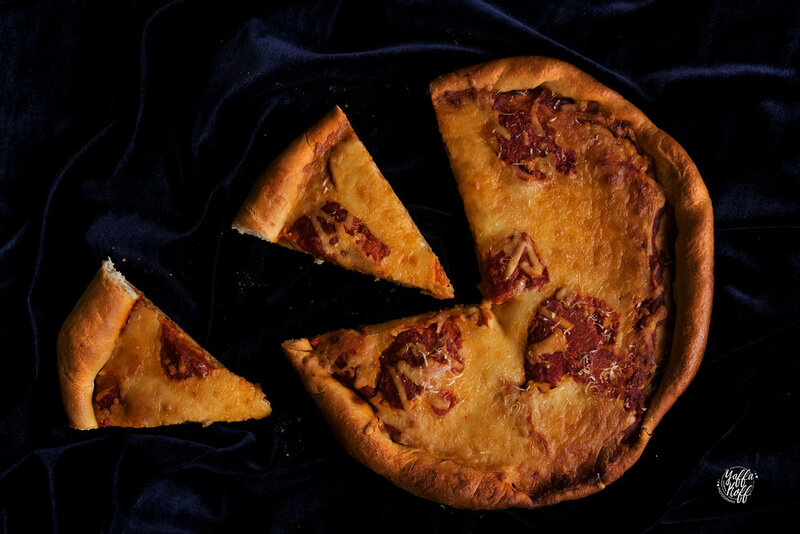 Bake for 15-20 minutes or until the cheese is bubbling, the crust is a golden to deep brown and the pizza has reached your desired level of doneness. Check out some more amazing Shabbat posts from my fellow Bloggers!